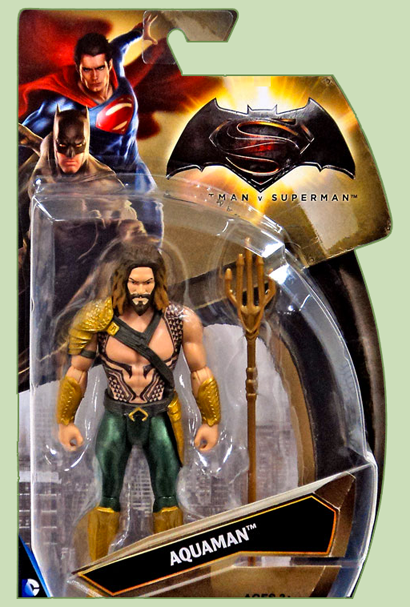 The, er, flood of BvS-related Aquaman toys started while the Shrine was still on hiatus, so I'm still catching up a bit. This action figure was one of the first that appeared on store shelves. If I was Aquaman and had to walk around with all that heavy stuff on, I'd be pretty grim-looking too! So, does he frost the tips of his hair...or is that just seaweed? 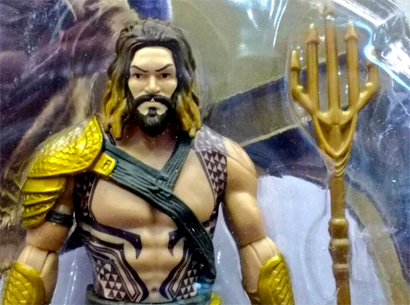 I honestly think the tips are bleached/frosted to satisfy all the 'but Aquaman is blonde' people. There's a repaint of this figure that I saw at walmart, with a silver trident. Also a pair of 10" figures- one in the classic duds, and one as the movie version. The latter is part of a BVS multi-pack, along with the Trinity, armored Bats, and armored Lex Luthor.